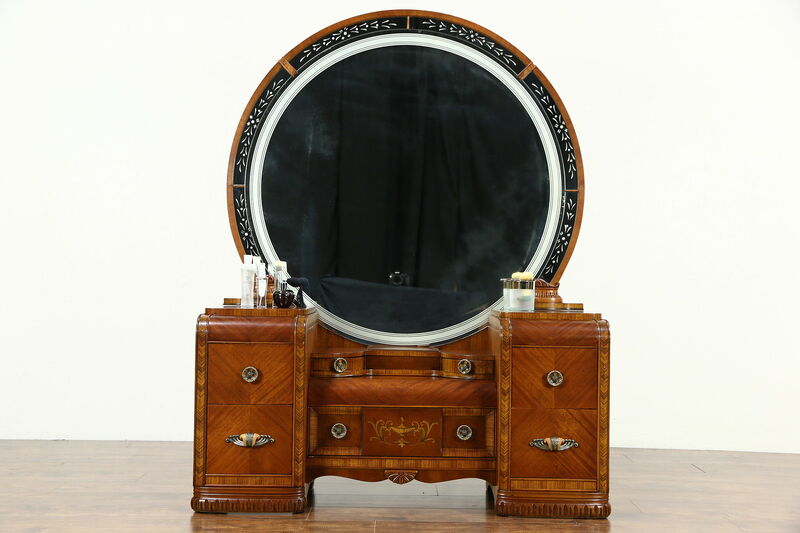 An Art Deco "waterfall" style vanity or dressing table from the late 1930's has an original etched round mirror. There are losses and a little smoke to the mirror and outer panes. Matched mahogany with zebrawood banding and inlaid marquetry, the restored finish is in excellent condition. The replaced hardware with bakelite inserts is authentic style on this American made vintage furniture. Drawers have solid oak dovetailed sides. The mirror is removable for easier transport. Size is 50" wide, 19" deep and 65" tall.